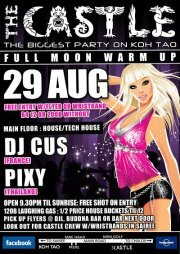 We invite you to our Full Moon Warm-Up Party at The Castle This Wednesday 29th August. 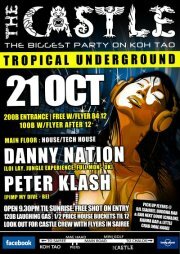 It’s gonna be another night of the Best House/Tech House tunes brought to you by DJ CUS (France) and PIXY (Thailand). 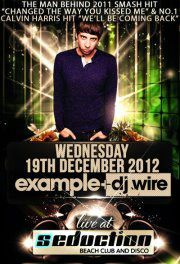 So come get your party on at Koh Tao’s biggest party!!! 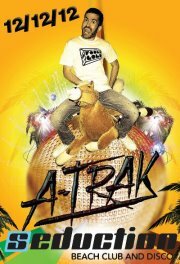 Grab a flyer from French Kiss (Sairee), DJL (Sairee), Buddha Bar (Chalok) or Bar Next Door (Chalok); or look out for our street team in Sairee with flyers to get you in for FREE before 12 (100 Baht thereafter) and you’ll also be in time for our Half-Price House Buckets special. We’ll also be serving up tons of Laughing Gas balloons at 120 Baht all night long, and don’t forget to try our “Castle Crack” bucket at 400 Baht with a free Castle vest.